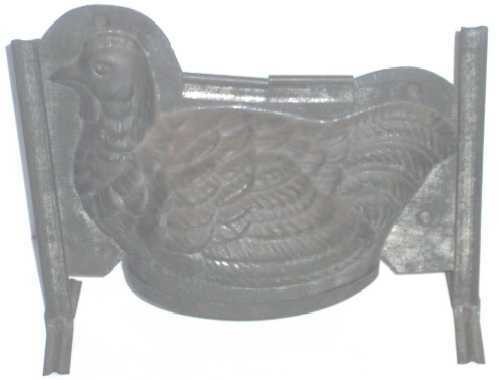 Presented here, a very rare and unusual Tin Mold that could be used for molding Chocolate, Ice Cream, or for making an Ice Mold! It is of a substantial size and is unusual in that it has an enclosed bottom as well as standing on "legs". The detail is wonderful as is the patina, that being the color of old pewter, as the early tin molds do as they age. It is 10" long and stands 8" high. The condition is excellent.